What’s Wrong With Being Depressed? An alleged psychological report on presidential candidate Noy Noy Aquion dating back to 1979 has surfaced. According to “this report”:http://www.abs-cbnnews.com/nation/04/27/10/villar-camp-revives-noynoy-mental-health-issue former which NPC President Guido Delgado circulated, a then 19 year old Aquino was said to be “suffering from depression and melancholia” partly due to his father’s incarceration during the regime of Ferdinand Marcos. This report was supposedly signed by Jaime Bulatao, a Jesuit Priest and was dated August 9, 1979. Father Bulatao through a letter has since denied the report. However, granting this report is true, what’s wrong with being depressed? Isn’t depression a natural human emotion? I will openly admit that I’ve been depressed several times over the course of my life. Especially because of the trials that I’ve been faced. Is there something wrong with me? Does this mean I am a lesser person than the next because I’ve been depressed? My answer would be no. There’s nothing wrong with being depressed. At the time that the report was supposedly made Noy Noy was a young man who has gone through a tremendous amount of trials such as the incarceration of his father and the other attacks thrown against his family by their enemies. That’s more than a lot of people could undergo and handle given their youth. If he became depressed, that would certainly be understandable. What’s important is that he got over it and since then has made something out of his life. Being depressed is not bad. It’s our way of coping through problems. What’s important is the ability to get over the depression and press forward. As the saying goes, “it’s not how many times you fall down, it’s how many times you get up”. That’s the same with depression. We’ll get depressed as we face trials and that’s fine. We should just find a way to get out of it in a timely manner. If the worse trait of Noy Noy is that he gets depressed from time to time then I’m willing to live with that. That doesn’t mean he’s a bad leader or a bad person, it only means he’s human. As the elections draw near, my choice of who to vote for becomes clearer and clearer. I am seeing and sensing desperation from some candidates and this only puts them in a bad light. A friendly advice to supporters of candidates don’t use tactics like this in order to sway others to your side, it only makes people think less of you and your candidate. If you want to convince me to vote for your candidate show me what they can do, their good qualities. Don’t show me the negative traits of the other candidates. That only makes you look petty. I woke up today with some really sad news. I got a text message saying that Basti passed away. Basti is the son of Joey and Sheila Valiente. He also had Pompe disease. I met Joey and Sheila years back. They got a hold of my name and contact details because I was listed as the contact person of the International Pompe Association (IPA) here in the Philippines. They had just found out that their son (then less than a year old) had Pompe disease. Like most parents faced with this life changing news, they were frantic in finding a way to help their son. I found myself at our dinner table talking to them. They flew all the way to Manila from Cagayan De Oro in hopes of finding help for Basti. Luckily that was also the time that clinical trials for infantile form of Pompe disease was being done. I know several people involved with this program so we talked about trying to get Basti in that program as well as see specialists that might be able to help him. Long story short, Joey, Sheila and Basti found their way to the United States and eventually was put on a program that allowed Basti to receive Myozyme, the first Enzyme Replacement Therapy for Pompe disease. This allowed Basti to live several years more. An infant diagnosed with Pompe disease usually has a mortality rate of up to around 1 to 2 years of age. With ERT this goes up dramatically depending on how soon the infant receives it. Basti received ERT and as a result his life was extended a few more years. In fact he celebrated his 8th birthday last February. I was told that Basti died peacefully in his sleep. He wasn’t sick prior to that. He just went to sleep and didn’t wake up. Maybe it was just God calling him home. Basti lived a happy life despite his severe disability. He had parents who loved him and who did all that they could to ensure that. We don’t know why these things happen. Why Basti was given a few more years only to be taken away suddenly. I’m sure God has his reasons. We only need to trust in that. I pray for Basti’s soul. I’m sure he’s up in heaven enjoying himself there. Most of all I pray for Basti’s family, especially Joey and Sheila. Their is a loss that will be hard to get over. After years of fighting, it’s hard to suddenly wake up and not have Basti there. I pray that they are able to get through this tough time. I didn’t get a chance to meet Basti personally because I only had the chance to meet with Joey and Sheila prior to their going to the United States. I have been always updated about Basti and his condition so I do feel like I know him well. He was also the first Pompe patient that I was able to help in my small way and he will forever be in my heart. 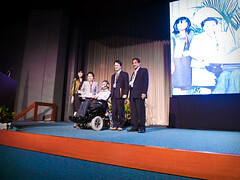 The “Philippine Pediatric Society”:http://www.pps.org.ph/ invited me to speak during their 47th Annual Convention. It was the last day of the convention and they asked me to talk about hope. Being in my situation, I’ve had the unique perspective of going through a lot of tough times. The thing that got me through it all and still does is hope. Well apart from my faith in God. They showed a short video of me that was made several years back and after wards I was introduced on stage to give a short speech/talk. Below is the text of my speech. I wanted to share it with you guys. Good morning ladies and gentlemen. I am honored to be here in front of you. Pediatricians hold a very special place in my heart. So much so that I was once asked “If I could choose the profession of my future wife, what would it be?” My answer was “a doctor, pediatrician to be specific”. I just feel that pediatricians are special breed of doctors. It’s not enough that you’re a good doctor, a pediatrician needs to be much more patient and compassionate because their patients are children. In fact right now, the doctor that administers my enzyme replacement therapy is a pediatrician. Well, it’s probably because I still act like a child sometimes. The author is an American novelist. This quote leads me to a conversation I had the other day with a father of a child with C.H.A.R.G.E syndrome. He narrated to me that when his child was born, barely a month old, he had a friend who also happened to be a doctor, tell him to give up on their child. It would be such a waste of economic resources as well as a huge burden to their family. There’s little chance that the child will have any sort of meaningful life ahead. The father refused to do that. With hope in his heart and with strength of conviction, he and the family pushed on. Today, his daughter is doing well. A lot of her problems have had remedies and she’s improving slowly but surely. Now even if the outcome was different and the child did not improve or worse died, it would have been easier to go through that journey with hope in your heart than despair weighing you down. This is not to say that we all should have blind faith and believe that everything will be ok. But we should always keep hope in our heart. My life is a story filled with hope. As you’ve seen in the video that was just played, I am receiving Enzyme Replacement Therapy, something that was not possible just a decade or more ago. Yet here I am right now, benefiting from it. When I was young and first diagnosed with Pompe disease, we were told that I might not live past the age of 30. There was very little work being done about Pompe and that I may not see a treatment or cure in my lifetime. Well, I’m 32 now and I think it’s safe to assume that I’m still alive. My parents never lost hope. That’s also what they instilled in me. While at that time we didn’t know how things would turn out, my parents always taught me to believe. Do what you can now, try your best but keep hope in your heart that just around the corner something good is coming. One of the first doctors that took care of me, said while we don’t know whether or not we’ll see a treatment or cure in your lifetime, we should prepare for that in case it happens. He asked me to focus on my diet, keeping healthy and staying strong. True enough, a few years shy of my 30th birthday I received my first infusion of Myozyme. The first Enzyme Replacment Therapy for Pompe disease. This has improved my life considerably allowing me to surpass the age that I was told I would not exceed. Hope is what got me through those years. I’ll be honest there were times that I was about to give in to despair but somehow, hope found a way. Hope is motivation. Hope allows us to win our small battles everyday. I am here today as an example of what hope together with the compassion, determination and support from doctors like you can become. I’m using my life in order to represent patients with rare disorders. To convey a message to the world that we deserve a right to life as well, that we shouldn’t be written off just because our situation is not as ideal as one would like. Modern science has improved leaps and bounds. We now have access to technologies that were once but dreams. The chances for improving lives of patients are better than ever. However sometimes these medicines or treatment will take time, hope is what will get people through in between. When families first realize that their child is sick, the first thing they do is bring the child to a doctor. You are their lifeline. They look to you for guidance. They look to you for hope. While I understand that there will be situations wherein there will be little that can be done, hope should always remain. For we can’t know for certain what the future will bring. I guess what I’m trying to say is that it’s just not about treating the physical symptoms it’s also about nurturing the soul. Christopher Reeves more popularly known as superman, one of the people that I admired in this world said, “Once you choose hope, anything’s possible”. Anything is truly possible with hope. The strength of the human spirit knows no bounds. As I continue to live my life with this disease, uncertain of what the future brings, I have hope in my heart that as long as I continue to do the best that I can, things will be fine. In the case that things don’t life is still certainly infinitely better with hope in my heart than despair weighing me down. Also when a person is hopeful it radiates and makes others around him hopeful as well. In life all that we can really ask of ourselves and of others is to do the best that we can with what we have and leave the rest to God. Whatever will happen will happen. As I close this talk of mine, I would like to extend my sincerest gratitude to the doctors that I’ve had the pleasure of working with all these years. Dra. Sylvia Estrada for the wonderful care that she and her team has given me. Dra Padilla, Dra. Silao and Dra. Dela Paz for their tireless efforts in helping the Philippine Society for Orphan Disorders as well as looking after patients with rare diseases. The wonderful team at the NIH who do so much for patients like me. I’d also like to thank the efforts of the people who work for companies like Genzyme who despite the small numbers of patients with rare disorders make a huge effort in coming up with treatments to keep us alive. The compassion and understanding of these people as well as tireless efforts in ensuring that patients like me have a future will forever be remembered. My life is possible through them. Oh, if there are any young single pediatricians out there… my number is…. Has it really been 463 days since my last entry? Yikes! Time has surely gone by. Well I’m back (I’ve said that before). Hopefully I’ll follow through this time. I’ll be posting more here. A redesign of my site is also underway. Please watch out for that. I’m thinking of porting it to WordPress. We’ll see.